Katie Louise is a University based singer-songwriter who only recently took the plunge to share her talent to a wider audience. After a Live Lounge session with LA1:TV and before performing at Bowland Bar as part of Lancaster Music Festival she took the time to answer some questions from the Culture team. If you had to describe your music in five words, what would they be? That’s a very tricky question in regards to the songs I write myself- emotional, sometimes fun, relative (hopefully to a lot of people), and hopeful as well, if that’s not too cheesy! How do you pick the songs that you want cover? Are they important to you or do they have a particular significance in your life? It’s a mix. Some of them I honestly just love to pieces, I often sing Paramore- The Only Exception, which is just such a good song and everyone loves it so I cover that. Sometimes I like to change things up a bit, I do a cover of L.I.F.E.G.O.E.S.O.N by Noah & the Whale and I changed that because I heard it and thought that I could do something different with it. It does depend on the song; there is no set reason why I pick them. How long did it take you to write your original song ‘Echoes’? Usually when I’m songwriting, I either plan to write a song and sit down for about five hours and write one or things just comes to me whilst I’m playing covers and I will just jot it down and come back to it another time. How did you feel posting your first YouTube video? It was literally the scariest thing and I wasn’t expecting anyone to view it at all because I didn’t really understand how it all worked, I didn’t really get it. My flat mate Tom was the one who told me to make a YouTube channel and I thought it was a bit crazy, so I did this video (Skinny Love) and I look a bit miserable in it to be honest because I was a bit nervous. I put it on and I just left it. I came back the next day and it had over 600 views, I was so shocked. When you perform to the camera for your videos and in this Sound Booth session, what do you imagine? Is it a big audience or do you fall into a zone that’s quite personal? When I perform at gigs usually, if there are a lot of people especially, I get involved with the crowd… I love it, I love them singing along. If it is a quieter gig, I tend to just go into my own little bubble. This is the first time that I’ve done something like this (Sound Booth) with the camera set up, which was a bit more nerve wracking than usual. Do you have a special way that you deal with your nerves or do you just grit your teeth and go for it? I just play, it’s only a few seconds of ‘this is a bit scary’ and then you just carry on. Adrenaline just kicks in. Are there any events that are coming up on campus that you might be involved in this year? I think that I will probably end up doing more Live at the Oak and Pendle Live, things like that. They seem to like me there- hopefully! I hope to be doing more gigs on campus and hopefully in town as well, but right now I don’t have much planned as there was a lot going on during Freshers. You are performing at Oxjam in Lancaster later this month – why did you decide to do this? Did the atmosphere of town have an impact or are you a supporter of the charity? To be quite cheesy, I’ve always done lots of volunteering and charity work anyway, different types of stuff. Anyone that knows me knows that it is a typical thing of me to do, like charity runs that kind of stuff. 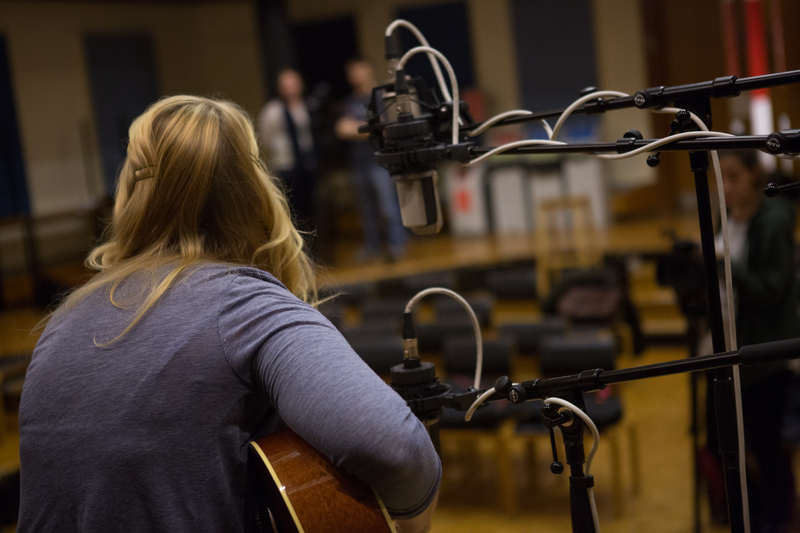 Do you have a favourite place around campus or at home that you like to go visit to write your own songs? I do write a lot of my songs in my bedroom, however, in the summer there is a little place nearby where I live that I do like to go- a little grassy area that’s quite nice. Last year I lived on campus in Furness, pretty much the heart of everything, so I just stayed in my room when I was song writing mostly. But I used to go and play down by Bonnington Step sometimes. You don’t study music, what do you study instead? I do Marketing Management. So it is quite different to music, but then again a lot of musicians do Physics and stuff like that. Finally, if you were an animal, what animal would you be? Or have a look at her Youtube channel and Facebook Page.